Research has shown that putting a baby/child in a car seat with a heavy coat puts the baby’s/child’s safety in jeopardy in the case of an accident because the straps are not snug against the little one’s body. The Bee-Seated Ponchos allow the car seat straps to be secured tight against the little one’s body while still keeping them warm. The instructions are simple. Put the poncho on the little one. Put the little one in the car seat. 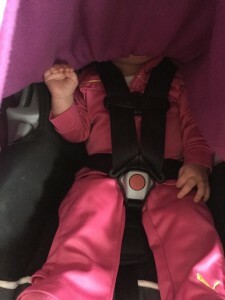 Once the car seat is secured in the car, lift the front of the poncho and secure the safety straps, ensuring that the straps are snug against the little one’s body. Always install the car seat, and fasten safety straps as directed by the car seat manufacturer. 3 Sisters “Shirley you CAN(cer) BEEnies” are comfortable and special.They are designed in honor of our dear Aunt Shirley who fights the fight every day. Every beenie, made with love, is handmade and unique. The beenies are fun, stylish, and warm! And just like us, no two are the same! 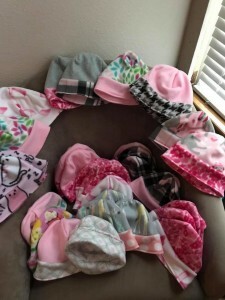 3 Sisters Non-Profit will take special requests, ensuring that beenies match the personality…colors, patterns, and design!